It seems that the old adage of the groundhog seeing his shadow has really brought about six more weeks of winter for us. A few weeks ago the high winds and tides brought disorder and tons of driftwood ashore for Point Robert's residents. Just last week another wind storm left many homeowners and shopkeepers without power for more hours than they had comfortably anticipated. While driving around The Point I noticed that the outward signs of the past storms were still evident with many branches and huge tree limbs on the ground and beach fronts strewn with debris. The question of social responsibility and reasonable timeline for "cleaning up the mess"
often remain for prolonged periods after a major storm or a catastrophe has past. In the case of Point Roberts many dwellers reside here on alternating weekends or seemingly very intermittent vacation schedules. Thus revitalization efforts are hit and miss at best. 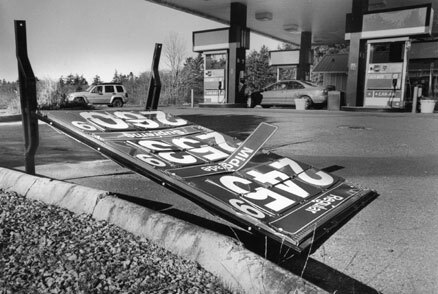 While driving down Tyee Drive several days after our most recent wind storm a gas station sign still lies overturned and bent out of shape. Hopefully this is really a fortuitous premonition their gas prices will also be coming down.